Facial paralysis. Trauma. Anastomosis. Surgery therapy. Graft. 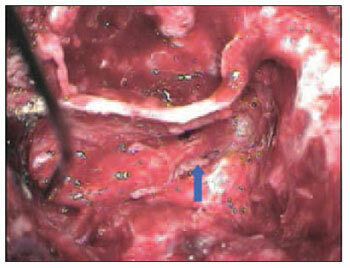 Introduction: In cases of partial lesions on intratemporal segment of facial nerve, should surgeon chose intraoperative way for partial reconstruction or partially remove injured segment and place graft? 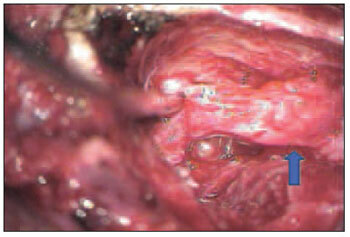 Objective: To present results from partial lesion reconstruction on intratemporal segment of facial nerve. Method: A retrospective study on 42 patients, between 1988 and 2005, who presented partial lesion on intratemporal segment of facial nerve. Patients were divided into three groups and the following was chosen: interposition of partial graft on the injured area of the nerve (group 1 - 12 patients); to keep the preserved part and perform tubulization (group 2 - 8 patients); to divide parts of injured nerve (proximal and distal) and place total graft of sural nerve (group 3 - 22 patients). Results: Fracture of temporal bone was the most frequent cause in all groups followed by iatrogeny (p>0,005). Results lower or equal III on House-Brackmann scale were: 1 (8.3%) patient on group 1; 0 (0.0%) patient on group 2 and 15 (68.2%) of patients on group 3 (p>0.001). Discussion: The best surgery technique for partial lesion therapy of facial nerve is still questionable. Conclusion: Among these 42 patients, the best achieved results were from total graft of facial nerve when comparing to others. Traumatic injuries on the intratemporal segment of the facial nerve can be caused by breaking of temporal bone(1-2-3), firearm or iatrogenic injuries or during otological surgeries(1-2-3). Although iatrogenic injuries have been decreasing due to surgeon improvement and popularization of intraoperative monitoring of the facial nerve, many cases have been occurring in our department for the past 15 years. On the other hand, other types of etiologies of traumatic injuries of such nerve have been increasing in big cities due to urban violence. Our hospital is taken as a reference of emergency cases in the city of São Paulo and also as a third party reference hospital in the country. In cases of injuries on segment of facial nerve, should surgeons preserve the segment or divide it and place autologous graft? 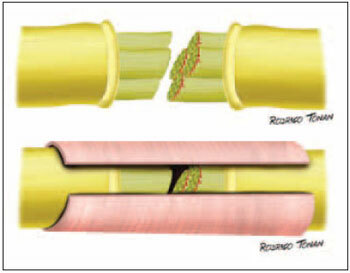 What if they preserve injured segment, place partial graft or leave the injured parts and perform a tubulization? 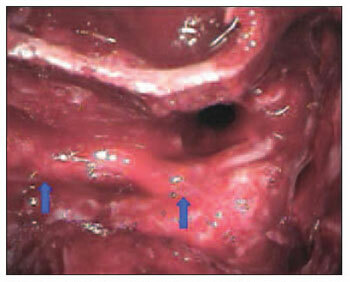 This study aims to present patients who suffered from partial lesion of facial nerve on intratemporal segment and underwent three different types of anastomosis, with the purpose of helping surgeons on the best action. It was performed a retrospective study between 1988 and 2005 on 42 patients who presented peripheral traumatic facial paralysis. During facial nerve surgery, it was noticed that 30% of its diameter was preserved. Transmastoid access was performed in all patients and they had a one-year post surgery follow-up. House-Brackmann (HB) scale was used to evaluate pre and post-surgery results. The criteria for selecting patients were: patients with injury for less than one year; peripheral facial paralysis type HB V or VI and 90% of nerve degeneration on electroneurography from the three facial parts (frontal, orbicularis oculis and orbicularis oralis) and/or electromyography with no regeneration sign. All surgeries as well as partial and total anastomoses were performed by the same surgeon (main author), according the technique previously described by him and fixed with fibrin adhesive4. Tubulization was performed with temporalis muscle fascia totally involving the injured segment of the nerve. (Picture 1). Picture 1 - Schematical drawing of the tubulization surgery approach. Medical files were analyzed in order to determine etiology; paralysis and post-trauma surgery period; type of surgery; facial segment where injured lay; injury extension at facial nerve length; neuroma presence or absence and clinical condition one year after surgery. All neuromas were removed during surgeries (Pictures 2 and 3). Picture 3 - Schematical drawing of an amputation neuroma. This study was approved by Ethics Committee of the Hospital das Clinicas de São Paulo (protocol # 0291/07). The nerve segments were divided into four as it follows: labyrinth portion; tympanic portion; mastoid portion and tympanic and mastoid one. The nerve diameter on injured part was also classified into: less than 50% and more than 50%. All of the cases which have been selected for this study presented up to 70% of the diameter of the injured nerve and at least 30% of the diameter of the preserved nerve. (Pictures 4 and 5). Picture 4 - Image of a partial injury of mastoid segment (second knee) on the left facial nerve. Picture 5 - Schematical drawing of a partial injury on facial nerve. Regarding types of surgeries, patients were divided into three groups: 1) interposition of partial graft on the preserved area of the nerve on 12 patients (Picture 6); 2) to keep preserved part and perform tubulization with temporalis muscle fascia on 8 patients), and 3) to divide parts of proximal and distal injured nerve and place total graft of sural nerve on 22 patients (Pictures 7 and 8). Picture 6 - Schematical drawing of the surgery approach of partial graft. 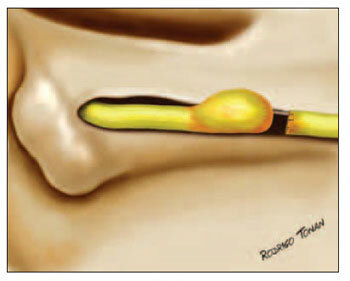 Picture 8 - Schematical drawing of complete graft of facial nerve. Continuous variables with homoskedasticity and equality of variances evaluated through Levene test were compared by Student's-t test for independent samples. Continuous variables that did not follow these criteria and ordinal were submitted to Mann-Whitney U test. Categorical variables were compared by using Q-square test and Fisher's exact test. The significance level was 5 % (p < 0.05). Gender and age distribution did not present an expressive difference (p>0.005). Temporal bone breaking was the most common etiology followed by iatrogeny and firearm projectile in all groups (p=0.7) (Table 1). The period between injury and surgery was 27.8 (±19.2) days for group 1; 32.8 (±23.8) for 2 and 50.5 (±28.4) for group 3 (p=0.05) (Table 1). Mastoid segment was the most affected in all groups, as it follows: 58.3% (7) of patients from group 1; 87.5% (7) of patients from group 2 and 63.6% (14) of patients from group 3. Tympanic segment was affected in 25.0% (3) of patients from group 1, 12.5% (1) and 13.6% (3) of patients from group 2 and 3 respectively. Patients affected in both tympanic and mastoid segments accounted for 16.7% (2) from group 1; 0.0% (0) from group 2 and 22.7% (5) from group 3 (p=0.53) (Table 1). None of the groups were injured on labyrinth segment of facial nerve. Regarding injury length of the nerve, 75.0% (9) of patients from group 1 presented injury ? 5mm; 25.0% (3) presented injury between 6-10mm. In group 2, 87.5% (7) of patients presented injury ? 5mm and 12.5% (1) presented injury between 6-10mm. There was no injury larger than 10mm in groups 1 and 2. Yet, in group 3, 40.9% (9) of patients presented injuries ? 5mm; 18.2% (4) presented injuries between 6-10mm and 40.9% (9) of them presented injuries larger than 10mm (p=0.02) (Table 1). Fifteen (35.7%) patients presented injured facial nerve more than 50% of its diameter (p=0.11). Only 31.0% (13) of patients presented facial neuroma (p=0.73). Regarding results one year after surgery, group 1 66.7% (8) of patients presented HB IV and 25% (3) presented HB V. In group 2, 75% (6) of patients presented HB IV and 25% (2) of them presented HB V. In group 3, 27.3% (6) of patients developed HB IV and only 4.5% (1) presented HB V (p=0.001) (Chart 1). 8.3% (1) of patients in group 1; 0.0% (0) in group 2 and 68.2% (15) in group 3 presented results ? III on HB scale (p<0.001) (Chart 2). Chart 1. Results displayed on House-Brackmann scale, 1 year after surgery. Chart 2. Patient reporting results < III on House-Brackmann scale, 1 year after surgery. Temporal bone is easy to be affected under head and neck injuries by its position, what can cause peripheral facial paralysis(5). The difficulty in comparing cases of peripheral facial paralysis surgeries is not only due to injuries variations, but also the difficulty in having groups with systematic comparisons. In accordance with other author, we report that early surgery therapy (up to 3 weeks from the start of paralysis) presents better results(1-5-6-7-8). Part of our patients search for therapy at least 60 days after paralysis having started, and as mentioned above, results would be better if it was treated as early as possible. It is our routine to submit patients with temporal bone trauma and peripheral facial paralysis to CT scan, audiometric tests, electroneurography (ENoG) and electromyography (EMG), and the two latter provides information on when to operate. All degree scales for peripheral facial paralysis are subjective and with imperfections. HB scale is easy and well accepted by professional(9-10). Surgery approach depends on surgeon and patient. In our department, we prefer transmastoid access on patients with intratemporal injury. On the other hand, when diagnosis says injury affects geniculate ganglion or labyrinth segment, we choose translabyrinth approach (if patient presents profound hearing loss), or middle fossa approach(11) (if the patient presents preserved audition) or both techniques combined(12), depending on injury location. Anastomosis is performed if total or partial disruption occurs. It is important to avoid closing under tension; and when injury causing loss of long neural tissue occurs we prefer performing graft with sural nerve. Anastomosis is done by making us of fibrin adhesive as it reduces foreign body reactions, scars and also it helps suturing when compared with nylon suture(4-13-14-15-16). All patients with peripheral facial paralysis that search our department are submitted to a facial nerve rehabilitation program, which consists of both physio- and psychological therapy. Patients who remained with peripheral facial paralysis HB V or VI were sent to hypoglossal-facial anastomosis evaluation. 1. Marais J~ Murray JAM. Repair of the injured facial nerve. J Clin Otolaryngol. 1995~20:387-389. 2. McQuarrie I~ Grafstein B. Axon outgrowth enhanced by a previous nerve injury. Arch. Neurol(Chic) 1973~ 29, 530-533. 3. Ducker TB. Metabolic factors in surgery of peripheral nerves. Surg. Clin N. Am. 1969~52:1109. 4. Bento RF, Miniti A. Comparison between fibrin tissue adhesive epineural suture and natural union in intratemporal facial nerve of cats. Acta Otolaryngol 1989~465:1(suppl). 5. Telischi FT~ Patete ML. Blast injuries to the facial nerve. 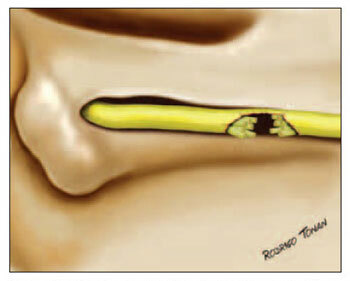 Otolaryngol Head and Neck Surgery. 1994~ 111:446-449. 6. Fisch U. Prognostic value of eletrical nerve test in acute facial paralisis. Am J otol 1984~ 5:49-48. 7. Fisch U. Facial paralysis in fractures of the petrous bone. Laryngoscope 1974:84(12):2141-2154. 8. Chang CYJ, Cass SP. Management of facial nerve injury due to temporal bone trauma. Am J Otol 1999~20:96-114. 9. House JW, Brackmann DE. Facial nerve grading system. Otolaryngol Head Neck Surgery 1985~93(2):146-147. 10. House JW. Facial nerve grading systems. Laryngoscope 1993:2056-2069. 11. Bento RF, Pirana S, Sweet R, Castilho A, Neto RVB. The role of the middle fossa approach in the management of traumatic facial paralysis. Ear, Nose & Throat Journal 2004~83(12):817-823. 12 .Quaranta A, Campobasso G, Piazza F. Facial nerve paralysis in temporal bone fractures: outcomes after late decompression surgery. Acta Otolaryngol 2001~121(5):652-655. 13. Junior EDP, ValmasedaCastellón E, GayEscoda C. Facial nerve repair with epineural suture and anastomosis using fibrin adhesive: Na Experimental study in the rabbit. American association of Oral and maxillofacial surgeons J Oral maxillofacial surgery, 2004~62:1524-1529. 14. BeriniAytés L, SobréReche N. Sistema adhesiu de fibrina en la reparació Del Nervi facial. Protocol de model experimenta en el nervi facial conill. Barcelona, Spain, Facultat d´Odontología, Universitat de Barcelona, 1995. 15. Becker CM, Gueuning CO,Graff GL. Sutures of fibrin glue for divided rat nerves: Shwann cell and muscle metabolism. J Reconstr Microsurg 1984~1:139. 16. Feldman MD, Staloff RT, Epsteinn G. Autologous fibrin tissue adhesive for peripheral nerve anastomosis. 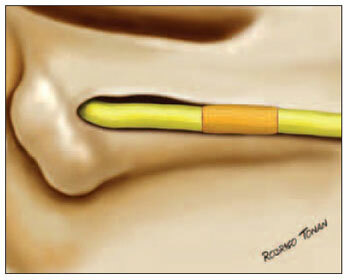 Arch Otolaryngol Head & Neck surg 1987~113:963. 1. Professor of ENT discipline at Faculdade de Medicina da Universidade de São Paulo - Head of Ophthalmology and Otorhinolaryngology Department - Hospital das Clínicas da Faculdade de Medicina da Universidade de São Paulo - HC FMUSP. 2. ENT Doctor (under complemental training) - Expert in Otological and Cranial Base Surgery at HC FMUSP. 3. Professor of ENT discipline at HC FMUSP. Assistant Doctor of the ENT Department at HC FMUSP. 4. ENT Doctor - Expert in Neurotology and Cranial Base Surgery. Post doctorate student in Otorhinolaryngology by HC FMUSP. 5. ENT Doctor (under complemental training) - Expert in Otological and Cranial Base Surgery at HC FMUSP. Departamento de Otorrinolaringologia, da Faculdade de Medicina da Universidade de São Paulo. ENT Department - Medical School at University of São Paulo. This article was submitted to SGP (Sistema de Gestão de Publicações - Publication Management system) of R@IO on November 2nd, 2007 and approved on November 7th, 2007 at 23:58:57.